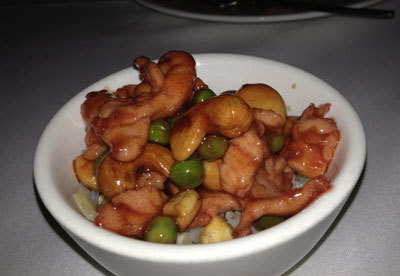 Loaded with cashew nuts, tender chicken, and glistening sauce with a delicious tang, Mandarin Court's Kung Pao Chicken does the tango in my mouth. I know it's rude, but this is the one dish I don't want to share - just thinking about it gets my mouth watering. When the sizzling hotplate of juicy looking Mongolian lamb arrives decorated with fresh spring onions, I reluctantly give up a small portion of my Kung Pao Chicken for some lamb. Some common sense kicks in as I realise I simply can't take every dish for myself. But the food isn't all I love about Mandarin Court. It's warm, inviting and interesting and the pretty Chinese interior is a pleasure to relax away the hours in, especially the comfortable booths. Service is quick, efficient and friendly. There is usually a live singer with a musical instrument and while the songs and singers may not be great, they are non intrusive and provide an added layer of ambience and interest which works well to add to the overall experience. 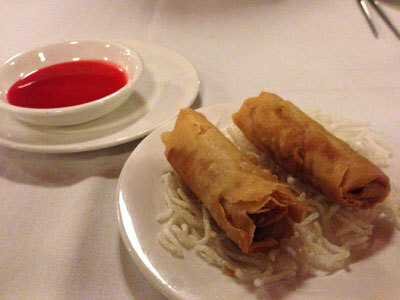 The Peking Duck served with little pancakes here may not be cheap, but they are absolutely heavenly. 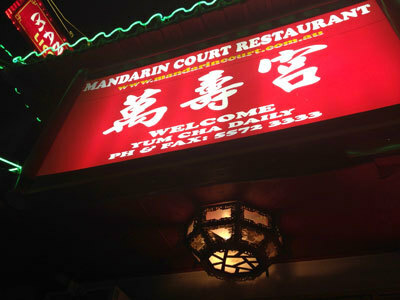 There are so many Chinese Restaurants on the Gold Coast, but few who do chicken, lamb and duck dishes as well as Mandarin Court. I haven't had the seafood here, so I can't comment on it, except to say I expect it would be extremely fresh as they do have a live tank of crabs and lobsters. Mandarin Court don't use MSG (as per their advertisement), but still get bucket loads of flavour into the food and present dishes that taste as appealing as they look. It is difficult to leave here without at least ordering a dessert to share. For those that can't find Deep Fried Ice-Cream anywhere, you'll find it here, with a caramel sauce to finish it - Mandarin Court have perfected this dish. Located on the Gold Coast Highway in Mermaid Beach on the Gold Coast, Mandarin Court always serves up a fantastic tasty dish that leaves me eagerly planning my next trip before even finishing dessert. While I do enjoy going to Chinatown in Brisbane, the fact still remains that Mandarin Court is still my favourite Chinese Restaurant.